10 Years ago my buddy Tommy Doyle collected me from my old job. I handed back the keys to my five month old Saab 93 (that was tough as it was the best car I had ever driven!) and I handed in the keys to the office – I was done with my well paid job as General Manager and about to start my life as a 100% self employed person. Tommy took me to O’Brien’s in Little Island for a sensible breakfast before we started a day of celebratory drinks – the boy was set free!! While I was in celebratory mood quietly I was really nervous – I had just shut the door on a long and quite successful career in the drinks industry and was about to enter a new world, which required me to totally reinvent myself and put bread on the table at the same time. We opened an office in Cork city – who remembers the punishing four flights of very uneven stairs? We had to write off nearly €200k in bad debts over three years, mostly because people were unable to pay but we did get caught by some chancers as well – the Credit Control Warrior and Famous were born! We got married eventually – Dee still calls it “her” wedding! No crystal ball could have predicted these 10 years, the variety, the speed that it has flown by, the tough economy that have us working our socks off and digging deep continuously, the sadness and the smiles, the stress and the joy, the worry and the excitement, the highs and some lows, the friends and team mates past and present. I have had to totally reinvent Greg, bringing all of my old skills and moulding these into a new sector including social media which didn’t exist 10 years ago when I started this journey. When I tell people I started off life as an accountant most won’t believe me! 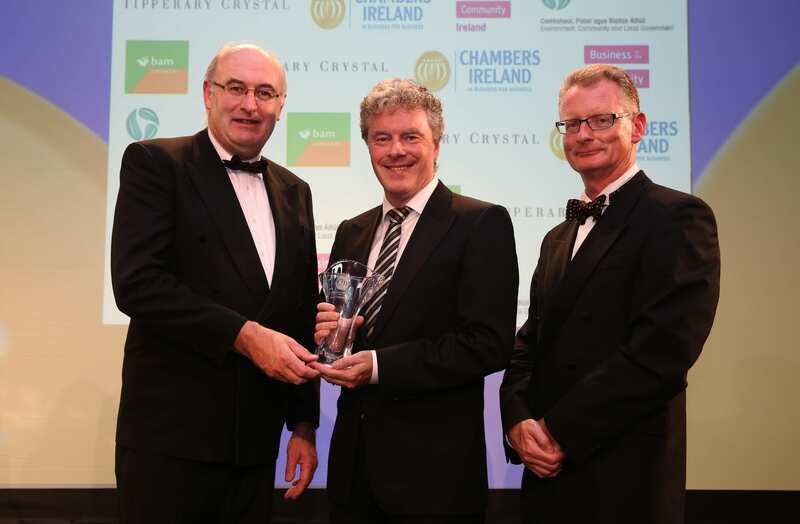 For me the culmination of this 10 years was accepting a National Award at the Chambers Ireland, Corporate Social Responsibility Awards event last week for the work we did on “Safebook“, which was really my baby. We designed a simple info-graphic to encourage our young people to behave responsibly and respectfully online and a simple “how to” if they are victims of cyberbullying. All of the Fuzion skills including PR, Design and my knowledge of social media helped us to push this out internationally to over 100 countries (a few months ago we were asked to translate it into Hungarian for a conference in Zagreb!) – we are making a difference! What will the next 10 years bring for me and for you? This entry was posted on September 19, 2013 at 2:19 pm and is filed under Business Start Ups, Marketing, Personal development, Positivity, Social Media. You can follow any responses to this entry through the RSS 2.0 feed. You can leave a response, or trackback from your own site. Enjoyable post Greg – good stuff! Can’t remember how I ended up on your blog mailing list but I always take a bit of time out to have a quick read. Keep her lit! thanks Connor – that light is burning bright ! Congratulations to you both! Obviously a team effort all the way. The blogs are a great read…short & sweet and sincere! Here’s to the next 10 adventurous years for us all ! God – did we do all of that 🙂 Well you did promise me it would never be boring – it was and continues to be a lot of things – but never boring. What is the anniversary blog post n 2023 going to say? Dee – it won’t be boring ! Congrats Greg – it’s great to see SME’s thrive in this economy. Keep up the good work and I’m looking forward to seeing the post in 2023! Conor … 2023 – the thought scares me ! Glad I’ve been part of the journey Greg! Ali – so glad you have been part of it. We’re growing up together !! Well done Greg, even though we have never met, I can empathise with your highs and lows and deciding to go it alone in business. Love your Cork speak “My kids are both flying”. What a lovely run-through, Greg. It’s certainly been an interesting journey for you and Dee. Well done on the award as well. Great achievement! It’s amazing that Safebook has been used in so many countries. I remember reading your post on it a few months back and thought it was a very useful idea. Hopefully it’ll have a really positive impact. Definitely – at least some action’s being taken to tackle the issue. Well done again for both! Great story Greg. Enjoyed reading it. Well done to both of you. Congratulations!! Great little read on a Monday morning with my coffee. Love the positive spin – always welcome!! thanks Colette – it’s scary how it has flown by so quick! Congratulation Greg. If others in a position of power and influence shared your vision to bring about genuine change and your positive attitude, then the last 10 years would have been better for all of us. Oisin Humphreys. thanks Oisin – how are you keeping? Hi Greg, Still keeping the head above water. I have a new Chineese supplier for HLF bathroom heater light and fan units. So hopefully radically reduced pricing will bring a considerable lift in sales! Great post, what a terrific journey (so far) and to think 10 years ago was only 2003……..here’s to the next 10!! thanks Niall – the next 10 is well under way !